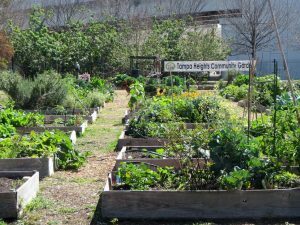 Community gardens are sprouting up across the Tampa Bay region, in deed-restricted suburban communities where individual home gardens are discouraged, in urban “food deserts” that lack fresh, affordable produce markets, and in a variety of places in between. Supporters note the many benefits the gardens provide, including greater access to healthy locally-grown food, opportunities for outdoor exercise, education and recreation, and chances to interact socially with a cross-section of the local community in a pleasant, relaxed setting. They also increase other aspects of community sustainability by reducing fossil fuel use for long-distance food transport, using composting to reduce landfill disposal of food waste and other organic material, providing fresh produce to food banks and other charitable organizations, returning unused (and often unsightly) parcels of urban land to productive use, and improving residents’ overall quality of life. mmunity gardens provide, Kitty Wallace, current president of the local Community Garden Coalition and past president of the Tampa Garden Club, organized a tour for the Sustany Foundation board that visited three Tampa gardens on March 27th. The three sites are using very different strategies, but each is successful in its own way. 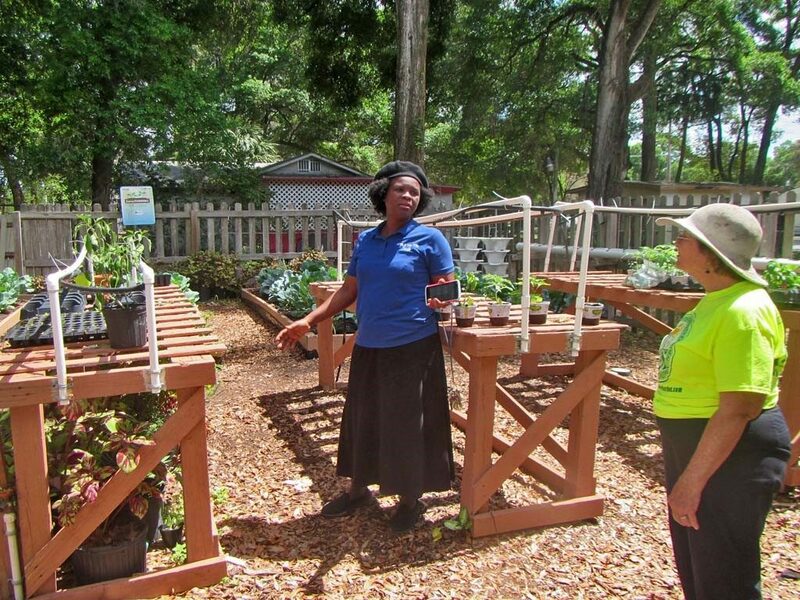 The first site on Kitty’s tour, the Tampa Heights Community Garden, follows a traditional approach that focuses on partnerships and working with a broad range of members from local neighborhoods. A project of the Tampa Heights Junior Civic Association, it also receives support from the Tampa Heights Civic Association, the Tampa Garden Club, Metropolitan Ministries, and several local residents and businesses. The garden opened in the summer of 2011, and won the Urban Agriculturalist Award from the Hillsborough County Fair that year. Individual garden plots on the site are 4’×8’, connected to a site-wide irrigation system, and come with the services of a master gardener who is available to answer member’s gardening questions. 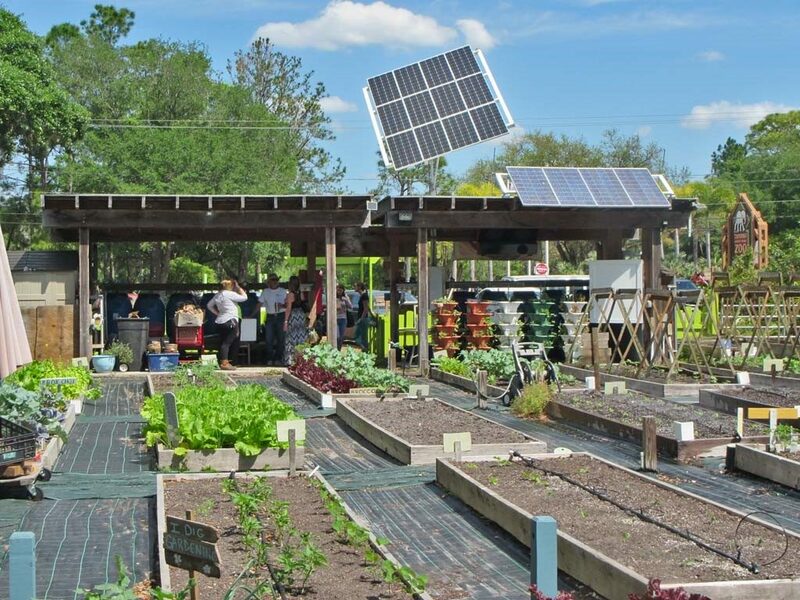 Located next to Interstate 275 just north of downtown Tampa, the site includes individual and communal gardens, a children’s garden area, butterfly and herb gardens, mulch storage and compost processing areas, and a cutting-edge “aquaponics” system. An array of solar photovoltaic (PV) panels will be installed to provide electrical power for the system in the near future. Aquaponics is an innovative approach that combines aquaculture (raising fish) and hydroponics (growing plants without soil in a water-infused medium), allowing the garden to grow edible fish and plants together in a single integrated system. Water and fish waste from the aquaculture tanks provide an organic food source for the growing plants, and the plants provide a natural filtering and treatment system for the water that is then returned to the fish tanks. Other important components are microbes (nitrifying bacteria) that thrive in the plant-growing media. They convert the ammonia from the fish waste, which could otherwise reach levels that would be unhealthy for the fish, into nitrites and then nitrates that serve as key nutrients for the plants. Earthworms and other organisms living in the plant growing medium also help to break down organic waste material and produce a ‘vermicompost’ that is beneficial for plant growth. Duckweeds, native aquatic plants that are easily grown in the hydroponics system, provide a large portion of the fishes’ food supply. The aquaponics system is thus a form of “circular economy”, in which the waste and other byproducts from one portion of the system are used as raw materials to support the other. It combines the two growing systems in a way that seeks to enhance the benefits and minimize the potential drawbacks of each. The second site on the tour, the Sustainable Living Project, is located on Sligh Avenue immediately across from the entrance to the Lowry Park Zoo. A project of the non-profit Tampa Bay Harvest, Inc., and a member of the Tampa Bay Network to End Hunger, it does its gardening on a parcel owned by the Salvation Army. 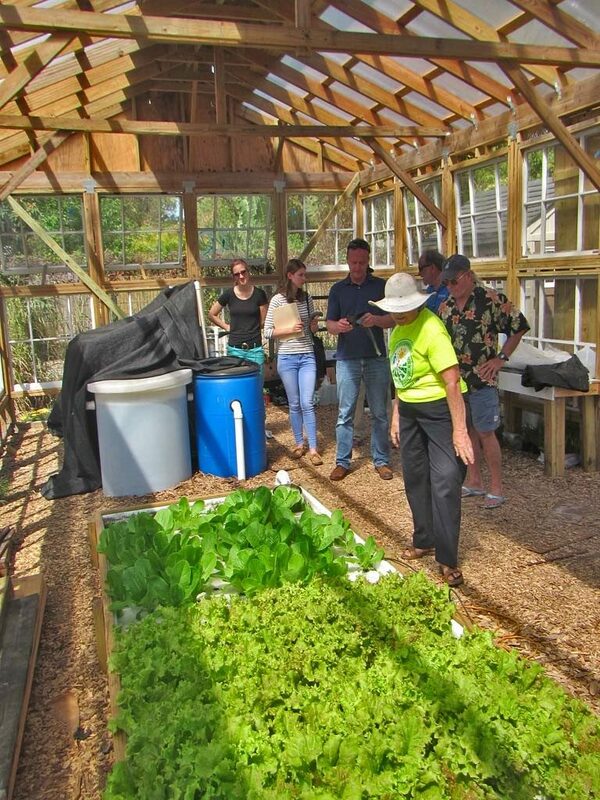 Like the Tampa Heights Community Garden, the project includes a productive aquaponics system. Most of the food produced on the site is donated to Salvation Army food kitchens and other charitable organizations in the area. The project is staffed almost entirely by volunteers, who focus primarily on food production and also provide community outreach and education. In addition to the Salvation Army, project partners include Chase Bank, the Boys & Girls Club, GCM Construction, the Lightning Foundation, Whitwam Organics, Lowry Park Zoo, Florida Engineering Solutions, and Meals on Wheels Tampa. The final stop on the tour, the H.O.P.E. 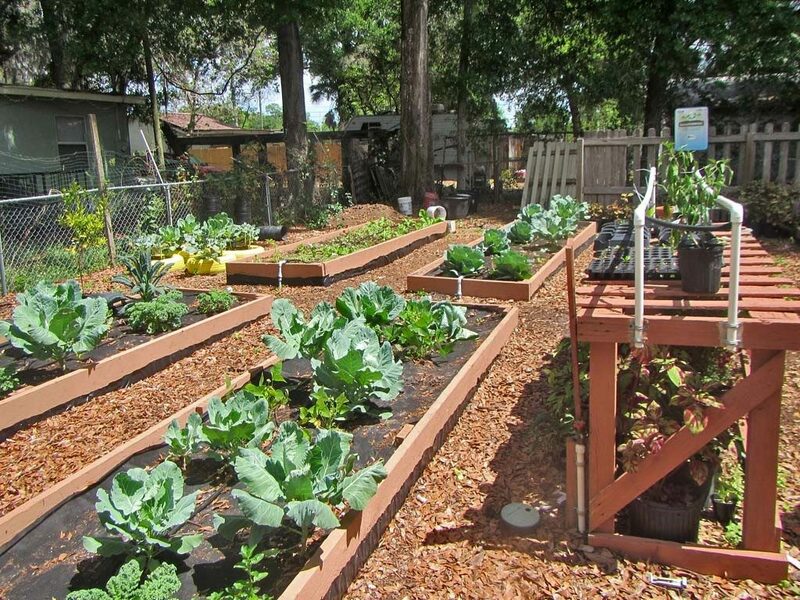 community garden, has been operated for a number of years as part of a faith-based school located on North 22nd Street in Tampa. It focuses on involving the school’s students in gardening and providing outreach and education on healthy food choices for the students and their families. The newest addition to the garden is a hydroponics-based growing system that has been installed and is expected to go into production in the near future. Suzette Dean (L) and Kitty Wallace (R) discuss seedling management at the H.O.P.E. Community Garden. Between them, these three sites give an indication of the number of different ways that community gardens can be structured and run. The key ingredient appears to be a committed group of people who will put in the time and effort needed to make them successful. Gardening beds at the H.O.P.E. Community Garden. 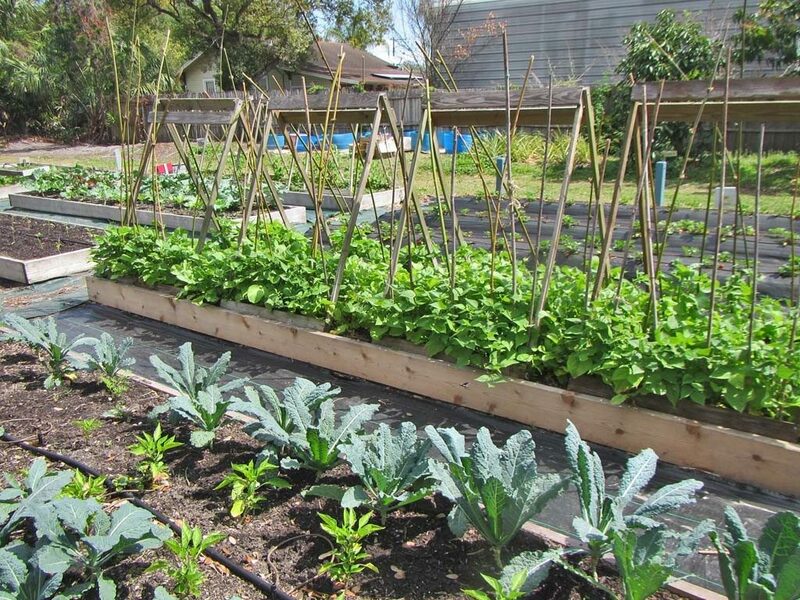 The Sustany Foundation would like to support these efforts, and recently provided funding to residents in the Robles Park community in Tampa, as part of the Foundation’s mini grant program, to help them begin constructing a community garden there. Others seeking small (up to $500) grants to help start or expand a community garden are encouraged to submit an application to the mini grants program (http://sustany.org/mini-grants/).